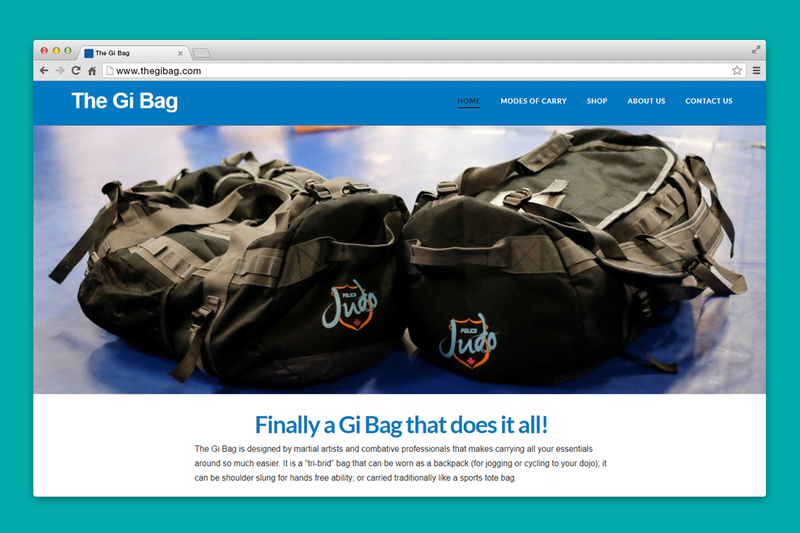 The Gi Bag | NetClimber Web Design Inc.
Blue Training Systems is a long- time client of NetClimber Web Design. The owner of home based business, Blue Training Systems, is a veteran law enforcement officer with over 20 years policing experience who has recognized some components missing in the collection of training equipment used by his field. Using his entrepreneurial and training skills, he started a business and produced two products, the Blue Baton (bluebaton.ca) and Eye Gouge Head (eyegougehead.com). At that time, NetClimber was able to assist in design, development and launch his first of two sites. 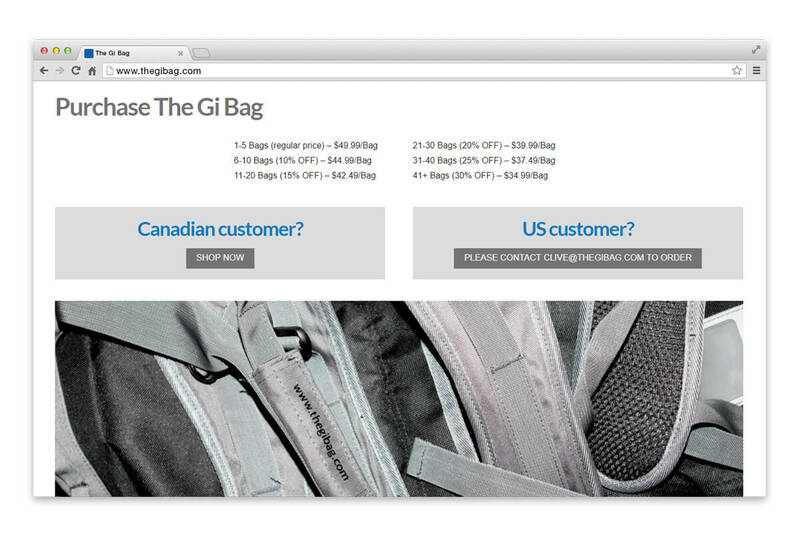 Recently, our client came to us with his latest product, the Gi Bag (thegibag.com). 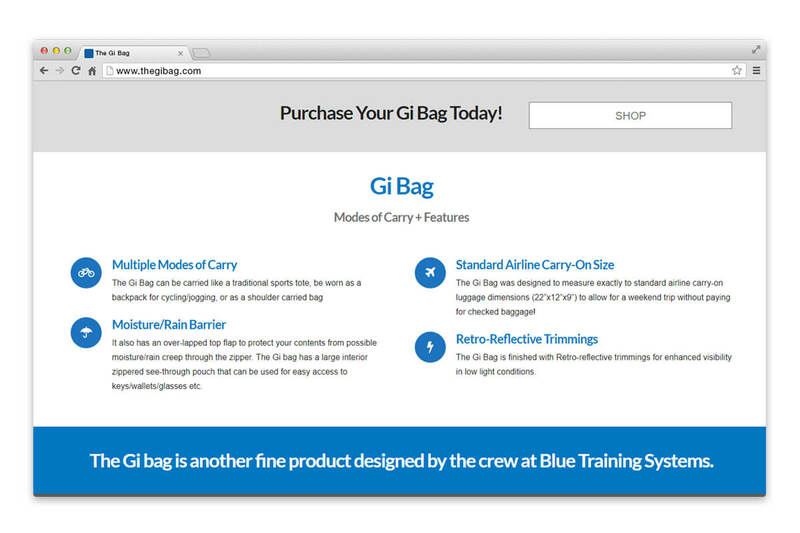 After consulting other combat professionals and martial artists, Blue Training Systems designed The Gi Bag, to make carrying all your training essentials convenient and efficient. This rugged bag can be carried as a backpack, shoulder slung, or like a traditional sports bag. Our client required a professional online platform that showcased product information with complementary brand colours and fonts. The website content and graphics needed to be seamlessly integrated into a single digital platform that would be fully responsive whether viewing on a computer, tablet or mobile device. NetClimber developed a Responsive WordPress site with Admin credentials for content management, and developed online product order forms, using the gravity forms plugin. The order form automatically connects to PayPal as a simple, yet secure payment gateway.